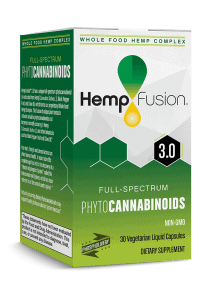 CBD Oil Review rates Hemp Fusion with three stars because it qualifies for the Quality, Mission & Innovation Badges. The people behind HempFusion seem driven by a desire to bring health, wellness, and natural medicine to those in need. Their products boast many innovative features we rarely see in the CBD industry, such as genuinely synergistic herbal formulas for increased bioavailability. A lack of relevant laboratory testing data has forced us to remain nominally skeptical about HempFusion, but their mission and their formulations are absolutely on point. They use a delivery system dubbed “Phospholivery System,” a non-GMO sunflower oil-based phospholipid compound that purportedly increases the assimilation of CBDs. Oil from the black pepper fruit makes an appearance in each formula, which has been shown to increase the bioavailability of many phytopharmaceuticals dramatically. 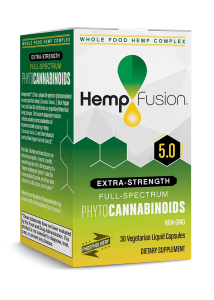 HempFusion uses not only the stalk, but also the seed of the hemp plant for their oils – this allows for the inclusion of multiple nutritional substances such as omega-3 fatty acids, vitamins, and minerals into all of their products. HempFusion offers just a few different products, ranging in price from $40 to $70. 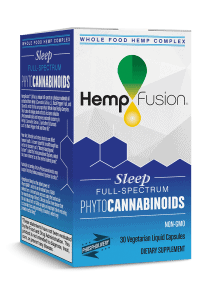 Functionality is the name of the HempFusion game, with formulations designed to treat insomnia, stress, and digestion. Keeping things simple is something few CBD companies seem to do well. It’s obvious that thoughtful and careful development are quintessential to HempFusion’s formulations. For example, their blend for insomniacs contains both Sensoril™ Ashwagandha and PharmaGABA, two scientifically-backed substances that help induce a state of tranquility and relaxation. This level of awareness is too often hard to find in a CBD company, and for that, we applaud HempFusion. Note: HempFusion has not discussed laboratory testing on their website nor have not published CoAs for viewing by the public. As such, we encourage conscious consumption when it comes to their products. Quality Verified – HempFusion claims to source all their ingredients from non-GMO, eco-friendly farms. 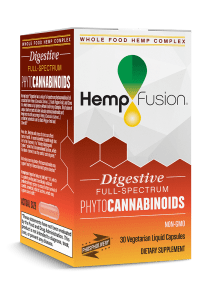 Mission Verified – Given their various executives’ backgrounds and website content, HempFusion appears committed to spreading as much information as possible regarding CBD and their therapeutic applications. 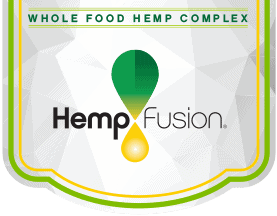 Innovation Verified – HempFusion uses not only the stalk but the seeds of the hemp plant, resulting in their signature “Whole Food Hemp Complex” (WFHC) for each product. Turned to Hemp Fusion after NSAIDS put me in the emergency room with an ulcer. First time used the 5.0 Stress capsules as needed to take edge off pain. Worked okay, did take the edge off and then Read that it works better to take daily and I am absolutely amazed at the pain relief and mood boost after the third day! I don't take zanax or anything for pain relief anymore. Arthritis in both knees, I have not walked this well in 2 years! 100% sold, 100% confident in the company. 100% afraid I will not be able to continue purchasing the product due to the price and for that reason, I give it a 4 out of 5. I have had great success with this product. I tried the 3.0 and depression lifted, anxiety was quieted. I started taking 2 doses of the 3.0, so have decided to go up to the 5.0. I recommend the product, anyone who struggles with PTSD, and mental health concerns will find so much relief with this CBD. Well done! Wish there was a discount program though for the disabled and low income, so everyone can be relieved from their symptoms. Nice review of HempFusion. I use their products daily and cannot say enough good things about the products and the company. I feel the difference and appreciate their approach to formulation.I would like to give a 5-star rating but only have the option for 3-stars. But they are definitely a 5-star company with 5-star products in my opinion. Amazing product!! Focus on Terpenes too, love it!